Many small to medium sized businesses struggle to develop their marketing materials internally in the absence of a dedicated marketing team. The day to day priorities of meeting customer orders, and the possible limitation of internal skills can often mean that the production of marketing literature or a web site is rushed due to only a small time frame being available to focus on your marketing projects. If this sounds familiar, we may be able to help. As a small company, we understand the challenge of marketing. While we can't write your marketing message for you, we can help you get that message out as fast and professionally as possible. Our Managing Director worked in PR, Advertising and Market research before entering the Computer Industry and our support department has the expertise to use computer technology to prepare attractive graphical designs. We can offer you our skills and expertise from designing your sales literature to establishing your presence online through websites. We can help you to craft your marketing literature into professionally designed brochures, flyers and mailers - all of our marketing literature is designed internally without any external input from a marketing company. We have experience in developing small to medium scale static sales\marketing focused websites - our own website was fully designed and built by us. Often our smaller clients just want this practical service to enhance their own efforts. If you want a wider marketing service we know small PR and Marketing companies who we can introduce to extend the service that we offer. 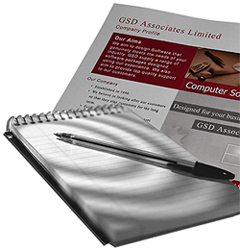 If you think we may be able to help you with your marketing work, please don't hesitate to contact us.